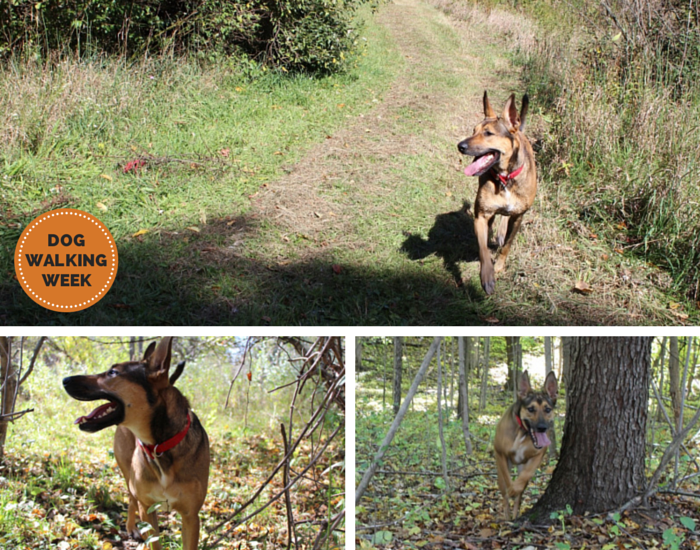 To spice things up for #DogWalkingWeek Laika and I decided to try out some new trails. Throughout the week we encountered many snakes, burs, bait piles, mud, and a persistent hippy that thought he could make Laika befriend his little Puggle. Right down the road from us there’s a nice big plot of land for sale so we decided to check it out. Luckily hunting season hasn’t began so I felt confident scouting around with Laika. We did encounter plenty of bait piles, mostly carrots, that were set up right under tree forts – hunters are getting prepared. I have no idea what Laika was thinking – why were all these glorious piles of carrots on the ground? Getting covered in burs wasn’t part of the original plan – but neither was not finding an easily accessible trail. Eventually we found a dirt bike path that’s been well maintained and things got much easier. This lot is beautiful. It has rolling hills, valleys, and a nice creek running through it. My favorite part is the dense forest – I’m sure it’s nothing in comparison to the Redwood National Forest but it feels so grand and serene – and it’s right down the road. We couldn’t cover the whole area in a day so we went back a couple more times throughout the week – always discovering new trails and interesting things to see and in Laika’s case sniff including 4 Garter snakes (one of which was a cute little baby). Being a big fan of reptiles I love finding Garter snakes – they do produce a mild venom but they’re generally harmless. Laika didn’t seem very impressed when I’d pick them up and start explaining to her their different anti predatory displays so we moved on. In my imaginary world I’d like to think I could buy this plot of land and build my own cabin. Sitting on the front porch with a nice rocking chair listening to the sounds of the forest. Not going to happen any time soon but it’s sure nice to dream isn’t it? 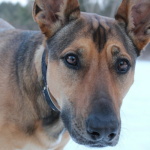 “Laika – come here – Don’t you dare go in that swamp.” Selevtive hearing. Muddy dogs are happy dogs, or so it seems – until the inevitable follow up bath. One of the other interesting places we checked out was the previous Edsel Ford retreat known as Haven Hill in the Highland Recreation Area. The carriage house, pool, and sheep barn remain but unfortunately the actual estate was destroyed by fire in 1999. We’re going back to this park this weekend – they’ve got so many trails we still have yet to walk. It’s one of the only parks in our area that allows dogs on the wooded trails so it’s a major bonus. You can only walk on the same pavement so many times before it gets a bit mundane. On the way back from the Haven Hill estate we encountered a man with his 5 children and their Puggle. I was a bit nervous as soon as I saw them approaching because Laika seems to have a severe dislike of small dogs (or horses) – though we are working on it. I call him a hippy because he had long hair and he used the words chill, whoa, and right on quite liberally. As they’re coming closer it’s obvious that Laika’s getting reactive; I’m trying to keep her in her comfort zone by backing up and going the other way to redirect her attention back to me. The last thing I want is for my dog to become over stimulated to the point of losing control. He’s walking right up to us, the whole horde of them – even though I’m politely telling him he shouldn’t approach with his dog. Laika loves children so I wasn’t nervous as they quickly approached her and began petting her. I was keeping my eye on dad and the Puggle. Well the meeting didn’t go well – as soon as the Puggle got within a foot of Laika she growled and they backed off. He said “peace” and headed on his merry way. I just need to point out that when you encounter a stranger and their dog and the person says something along the lines of “she’s not friendly” or “doesn’t like dogs” you should probably trust their judgment. After all, it is their dog. They’re probably more familiar with his behavior than you. Laika sokaing up the rays on the ruins of the Edsel Ford estate. Dog Walking Week was a lot of fun – we got out experienced some new places. Our goal for the week was to get out and try a new trail everyday and we succeeded. Exploring new grounds is a great way to keep your walking routine from becoming dull. Laika was going to bed earlier as well – all the extra stimulation of new sights, smells, snake education, the hippy & his Puggle, and new trails really wore her out. It’s so easy to fall into a routine – ours is walking the neighborhood every morning and night. I certainly don’t dread it, but it does become mundane. Just simply switching up the route or area keeps it interesting. It has a way of making the world seem so much larger and more intriguing for dog and owner alike. Not only did we get some extra miles in this week – we also gained some new enthusiasm for seeking out adventure (and also learned a little bit about snakes). 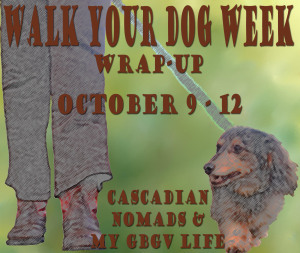 The #DogWalkingWeek Wrap Up Blog Hop is hosted by Cascadian Nomads and MyGBGVLife. We’re wrapping up by sharing our experiences from the week. Laika and I had a lot of fun seeking out new trails. We logged more miles than usual and found some new places we’d like to revisit. 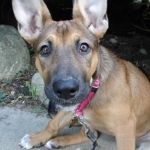 Be sure to check out the other blogs to see what adventures they encountered during #DogWalkingWeek. Who Doesn’t Love Silly Dog Poems? 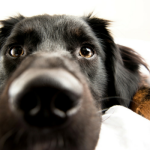 Is Your Dog a Jerk When You’re Sick? « Do Dogs Love Waiting In Cars? What is it with people not understanding when they are told go away? Amazing. My mom is terrified of snakes, so that would have been a nightmare for her. If we ever see a gardersnake, that is the end of it, we will never walk there again unless it is winter, and if we ever touched one, she says she will disown us. Rats, bugs, all that stuff is fine, but no reptiles. I really don’t know what the deal with people approaching dogs after telling them not to. I think they just assume since they have happy go lucky dogs that I must be over exaggerating. A lot of people are afraid of snakes – my boyfriend isn’t even fond of them lol. The estate place is beautiful-wish we had somewhere like that near us to walk! And it’s so infuriating and frustrating when someone won’t listen to you…..These were some great adventures! People have their own ideas about how to approach dogs apparently – even after they’re told it’s not a good idea. Laika looks so cute soaking up the sun! With the combo of snakes and a hippy in the title, I, of course, had to read this post! 😉 Looks like a wonderful place to walk, but that guy… why is it people don’t respect what we tell them about our dogs? I know, I didn’t want to bring it up at first because this is supposed to be about having fun – but I really needed to get if off my chest. It’s such an easy way to cause tension and a potential fight; I hope people can understand that it is important to respect what someone’s trying to tell you when it comes to dog behavior. I never understand people that ignore that warning – it makes no sense to me. Sounds like you had a great time – I didn’t get the photos to come up though – only the first one? I think I found the culprit with the images – there was a conflict between the java in my lazy load plugin & my minify one; it appears to be fixed (hopefully). Thanks again for the heads up, it’s frustrating when things don’t load properly. Lol… this hippy dude sounds like a character! Too bad he didn’t listen, oh well =/ Looks like Laika had a fun time and the scenery around there is very pretty! When I read your title, I thought you were going to be unhappy with meeting the snakes…LOL. I know I wouldn’t have been thrilled! Our Cricket doesn’t like all other dogs, and when we ran into someone with a dog I was able to take a wide berth and explained to the woman why I did. She never said a word back to me, which made me feel like she thought I had the worse dog in the world! Oh well, at least she listened to me. It looks like you found some great new places to walk. It’s fun to just explore around different areas and see where the paths lead! I bet Laika had one of the best days ever (except for the hippie and puggle moment). I love finding new places to hike with Haley, it makes walking much more fun for both of us. She loved it and I’m so happy to have gotten back some of that motivation for seeking out new hiking spots – it’s so easy for me to just stick to a mundane routine. Archery season is open. I guess they don’t bow hunt on the property. Seems early to bait for firearm. When I do buy my cabin I most certainly will do that :). I thought it seemed early for bait piles as well; we have been hearing a lot of shots lately so perhaps they’re just starting early. I have yet to see anyone bow hunt in our neighborhood – but then again I don’t know how likely it is that I’d notice them on the routes we normally stick to. I hope they are not shooting deer out of season. But waterfowl, goose, grouse, woodcock and small game are open so I bet those are the shots you are hearing. I think there may have already been some youth hunts (firearm deer) which happen way before the regular season starts.